Empowers staff and guests - they both love to use it! By Lorie Verdi, VP of the Restaurant Group at DataSource While many restaurant operators may be in good shape when it comes to meeting the caloric-labeling deadline of Dec 1, not all have considered the (print) execution efforts for menu boards, to-go menus, catering menus and related signage. 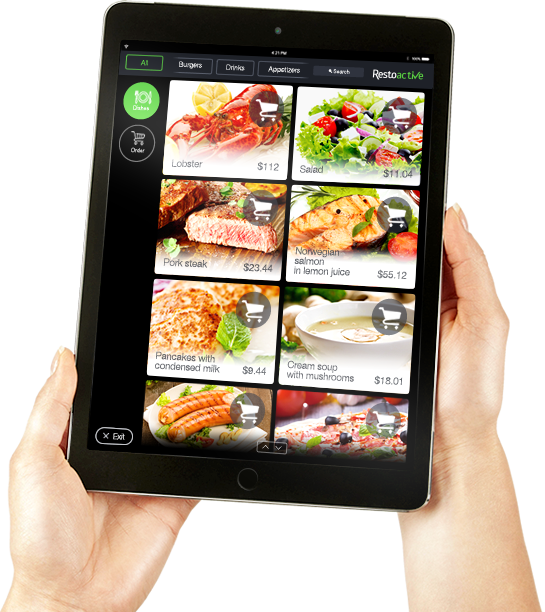 Technology to include ordering, loyalty program sign-up, games Jul 24, 2015 Ron Ruggless Ruby Tuesday Inc. will begin testing tabletop tablets early this fall, joining a growing number of casual-dining brands using the technology, company executives said Thursday. By Richard Saintvilus NEW YORK — Even with a stock price about 50% percent more expensive than its fast-food competitors, drive-in chain Sonic remains a good buy for investors, with same-store sales growth expected to fuel the continuation of more than two years of consecutive quarterly earnings gains. Restroactive’s easy to use mobile menus and kiosks allow you to redefine your restaurant without changing the way you do business. Now you can seamlessly add on to you existing legacy POS system and increase your bottom line with more sales, faster table turnover, improved menu management and reduced labor costs. Copyright © 2019 Restoative . All rights reserved.